Hi-fi can be such a confusing passion, with so many products to explore in the quest for better sound, but enthusiasts often start by upgrading their loudspeakers, as they’re where the greatest subjective differences are typically to be found. Most will begin with conventional box speakers, but many then progress to more left-field approaches – the most striking being ‘horns’. German manufacturer Avantgarde Acoustic specialises in precisely this genre, offering a range of horn-loaded speakers that spans relatively compact and room-friendly products like the Zero TA XD to the huge, crazily-proportioned Trio Classico XD. Sitting towards the lower end of the company’s range is the UNO XD that you see here – effectively the brand’s entry- level to its series of ‘proper’ horns. This loudspeaker, one might say, is ‘a horn design without tears’. How so? Well the breed is often wilfully eccentric – whacky, even – but the UNO XD is quite conventional, in some respects at least, employing modern technology to make a hybrid of passive horn-loaded treble and midrange drivers with active bass units. Given that the acoustic amplification of a horn greatly increases speaker sensitivity, Avantgarde ramps up the bass to match by using an active sub system featuring twin-powered woofers. In practice it’s rather more than a ‘sub’ because these bass drivers work right up to the 290Hz crossover with the midrange horn. ‘style’ of driver to any other isn’t always easy, and that goes double for marrying horn-loaded passive treble and mids to non-horn-loaded active woofers. 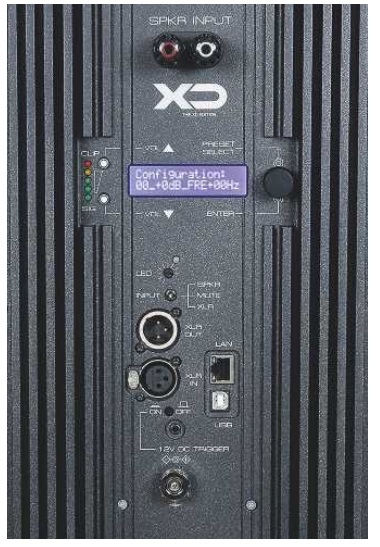 To help things along, the UNO XD’s active bass system uses highly configurable DSP, not only to optimally pair the drivers themselves, but also to let owners tailor the bass response to particular room acoustics and/or tastes. Volume settings, delay time, high and low pass filters and up to ten parametric equalisation curves may be programmed via a connected Mac or PC [see KH’s boxout, p39]. Unpacked but not assembled, this loudspeaker looks not unlike a conventional box design – it has no fancy radiused edges and the cabinetwork seems outwardly pretty standard, albeit reassuringly rugged. There’s even a detachable front grille, just as you would see on a heavyweight floorstander. Look closer however, and you’ll see threaded recesses for the two ABS pressure-moulded spherical horns, around the edges of both treble and midrange units [see pic, p41 ]. An effective bass horn is a very large device, so manufacturers of horn speakers often combine direct-radiating bass drivers with midrange and treble horns which, because of the shorter wavelengths involved, are much smaller. This creates a problem, though: how to match the high sensitivity of the horn sections in the bass? Avantgarde’s answer with the UNO XD is to use twin bass units and drive them using two 500W internal amplifiers, whose gain can be adjusted to offset the sensitivity shortfall. And Avantgarde goes further: by inserting A/D conversion and DSP ahead of the amplifiers it’s able to add powerful bass equalisation capabilities, under the management of its control software [see inset picture]. Set against this modern technology, the UNO XD’s midrange and treble horns are from another era, following a German tradition begun by Klangfilm in the early 1950s by using a Kugelwellentrichter (spherical wave horn) profile which assumes that the radius of the wavefront propagating through the horn remains constant along its length. The resulting horn provides good gain – our measurements indicated around + 17dB – and narrows directivity but, like all classic horn profiles, it makes assumptions about wave behaviour which are not borne out in practice. Reflections from the horn mouth and cross-modes within the horn cause resonances, some of which can be seen in the cumulative spectral decay waterfall [see Lab Report, p43]. 25mm mylar dome with a 130mm horn that’s 65mm long. The bass units feature 250mm paper cones with ferrite magnets, each driven by a 500W Class D power amplifier, while the DSP takes care of the (active) crossover. While the front is certainly eye-catching, the ‘business end’ is at the rear where the mid/ treble drivers are hooked up via a single 4mm cable input and the active bass driven either via a line-level XLR input or, preferably, a second set of high- level 4mm speaker connections. The DSP options can then be configured via a small backlit LCD panel, or remotely via LAN or USB connections. The main speaker cabinet sits on a special cast aluminium frame base with four very substantial, height-adjustable spikes. Avantgarde also makes great play of the UNO XD’s multiple finish options: the 30mm-thick MDF cabinet comes in White Satin, Black Satin, Tiger Rosewood and Zebrano finishes while the polished and lacquered horns come in no fewer than 11 colours – including the striking ‘Shiny Citrine Orange’ you see here. Setting up the UNO XD is simpler than it might first appear, especially with its built-in bass configuration modes that allow very fine low frequency tweaking to suit! Otherwise it’s a case of firing the speakers along the length of the room (you don’t want to be ‘looking’ down the horn throats) and then progressively toeing them in until you find the sweet spot. This is an unusual yet highly capable loudspeaker that is bound to impress those who hear it, in a number of different ways. Its standout characteristic is the insight that its two horn-loaded drive units give into a recording. They’re like twin searchlight beams shining bright and lighting everything up in front of them in great detail. Allied to this, a taut and solid bass underpins the entire performance while the cabinet seems sufficiently inert not to interfere with the most complex music at hand. to be surprisingly even and well integrated taken as a whole. It’s certainly one of the less extreme horn speakers I have heard, and as a result one with the widest appeal. Another striking quality of this speaker is its super-precise midband and treble. Whatever else it does well – and it does much with great distinction – you always keep coming back to the sheer focus that the UNO XD provides. For example, Ride’s ‘Leave Them All Behind’ [Going Blank Again; Reprise Records WPCP-4776] is a very dense bit of guitar-driven indie rock from the early ’90s. As a recording it’s very much of its time – super dry and crisp with lots of detail. It’s a great challenge for any hi-fi loudspeaker, because of the wall of distorted guitars that runs throughout the track, and the heavy compression. Despite this, the speaker delivered a remarkably finely-etched sound, capturing every last strum of the backing guitar, and each rimshot and cymbal strike. Indeed instruments separated out from one another with great clarity, so one could hear a host of different things under that heavy, effects-laden backing guitar layer. This speaker practically unpacks the production before your very ears. What might only be described as ‘transient speed’ is another of its inherent qualities, so music is delivered to you at a great pace, giving a ‘seat of the pants’ sound that makes everything come alive. Not only this, but the UNO XD is very good at delivering the subtle dynamic accents that make music so much fun – and distinguish a good performance from a great one. Grant Green’s ‘Ease Back’ [Carryin’ On; Blue Note TOCJ-8667] was a fine showcase for this – it’s a groovy slice of classic ’60s jazz with some serious syncopation going on between the Hammond organ and the rhythm guitar, plus some wonderfully slippery drum work. This speaker ensured all elements of the music gelled brilliantly together, with a sense of ‘interconnectedness’ that made listening both easy and insightful. ‘Avantgarde Acoustic stands for purity and performance, that’s our philosophy’, says founder Holger Fromme. ‘By purity, I mean the absence of impurity in a substance. So we try to make our speakers as simple as we can. At the same time we want incredible performance. So what sort of person buys an Avantgarde product? ‘Well, actually there are no typical customers. There are rich people and there are normal people, young and older people who buy our systems. But always they like music very much! Music is bringing people together.’ As with all Holger’s creations, the UNO XD’s design priorities were, he says, ‘form following function, which I believe it has its origin in the Bauhaus school’. For him, horn loading epitomises this. ‘Horns are based on the physics of mother nature. They embrace the same principles that govern the functions of the human ear. a joy, crisp and yet subtly resolved, and the rhythm guitar was disarming to behold, reminding us how fast hard-plucked strings can sound. However, if it’s a fat, sumptuous bottom end that you want, then look elsewhere. The UNO XD has a spritely bass performance, but one that’s arguably less prodigious than you might expect given the helping hand of its inbuilt amps. Tayla’s ‘Timefields’ [Various Artists’ Earth 4; EARTH CD004] possesses a strong bass line, noodling up and down throughout, as layer upon layer of percussion is added, and soft gliding keyboard sweeps wash around. The bassline is key here, giving the track motion and purpose, but was slightly underwhelming via the UNO XD. Then again, an extended but ‘quick’ sounding bass is by far the better match for the instrumental snap offered by those mid/treble horns. Horn loudspeakers can sometimes be a little too directional, but this was less evident with the UNO XD. Indeed, when correctly positioned, its ability to throw out a wide and deep soundstage, over a decent listening area, was impressive. So Bach’s ‘Oboenwerke’ [with Alexei Utkin/Hermitage Chamber Orchestra; Caro Mitis CM 0032003] sounded very spacious indeed. 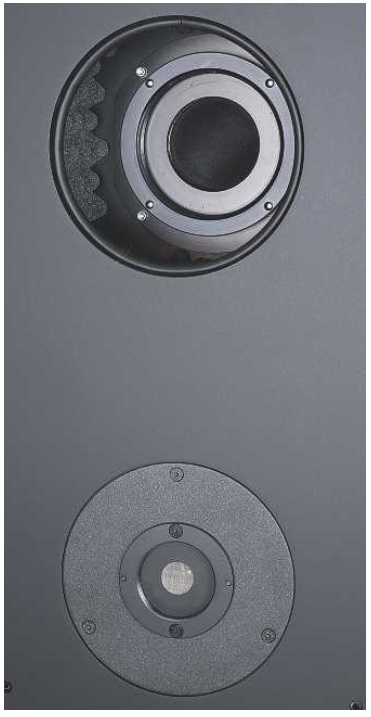 Although some big panel loudspeakers do better, this horn design made a fine fist of dissolving itself into the listening room and allowing the recording to develop confidently in three dimensions. The chamber orchestra was well focused, with instruments realistically located to the sides and back of the room. Furthermore, the speaker gave a great account of the ambience of the recording venue itself. Its clarity meant the listener could discern right back to the rear of concert hall, giving a highly immersive sound that was a pleasure to hear. High-end horn loudspeakers tend to be quirky and eccentric, but the Avantgarde Acoustic UNO XD is more room- and user-friendly than most, thanks in no small part, to the adaptable active bass system with its custom DSP. Most owners will find it easy to get the UNO XD working in any medium to large sized room, preferably via its high-level inputs, before enjoying its dizzying speed, superb dynamics and great detail. Avantgarde claims an astonishing >107dB sensitivity for the UNO XD but – measuring at 3m and correcting to 1 m – we couldn’t match that, our pink noise result being 102dB SPL for 2.83V. Bear in mind that Avantgarde’s spec, is for 1W input which, given the UNO XD’s nominal 18ohm impedance, may represent a higher input voltage. Not that 18ohm fits with our measured minimum modulus of 8.2ohm, which suggests a 10ohm nominal figure. This is still high for a modern loudspeaker nonetheless, and in conjunction with modest impedance phase angles results in a minimum EPDR of 5.6ohm at a high 16.3kHz, making the UNO XD an unusually easy speaker to drive. Not so encouraging about the impedance result is that the modulus vs. frequency and phase vs. frequency traces (not shown) are notably uneven, suggesting the presence of multiple midrange resonances. 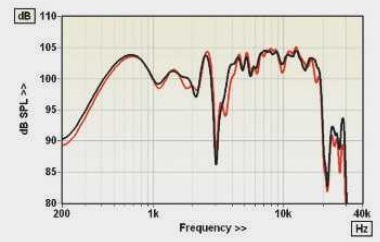 Because of the 3m microphone distance the resolution of the forward frequency response measurements [Graph 1, below] is reduced to about 450Hz and the roll-off below that is an artefact. Not ignorable is the deep but narrow notch at 3kHz, smack on the specified mid/treble crossover frequency, which probably results from imperfect time alignment of the mid and treble horns. (Note that we followed Avantgarde’s advice and used a microphone height equal to the mean height of the two horns.) This contributes to very high response errors of ±9.2dB and ±8.6dB, respectively. Pair matching, over the same 500Hz- 20kHz frequency range, is also poor at ±3.9dB although the worst disparities are narrowband. 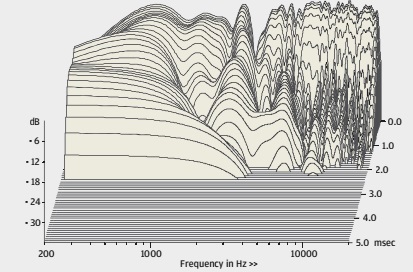 The CSD waterfall [Graph 2] can’t resolve the midrange resonances but a succession of treble resonances is still clearly visible.